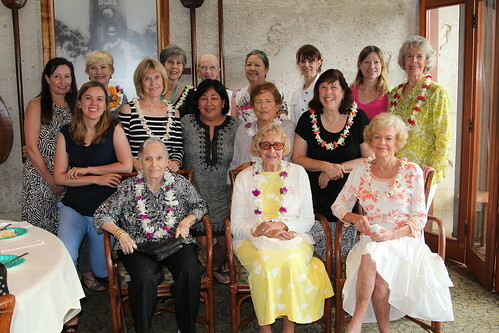 Mahalo to everyone who joined us for our Founders' Day and 90th Celebration. We recognized two members, Sally and Roslyn, for staying true to Pi Beta Phi for 50 years. We also recognized Elaine as a Diamond Arrow for her 75-year membership with Pi Beta Phi. After our meals, we enjoyed a delicious angel food cake brought by Pam Ednie. We also had a candle passing to celebrate Tyre's pregnancy and Jessica's engagement. Vice President - Brenda B. Recording Secretary - Sally P.
Corresponding Secretary - Diane G.
Literacy Chair - Pam E.
Cookie Shine Chair - Sandy D.
Make It, Bake It Chair - Sally P. & Amie K.
Founders' Day Chair - Susu M.
If you are interested in a leadership position, please contact Jessica at piphihawaii@yahoo.com. We are still looking for a Panhellenic delegate! 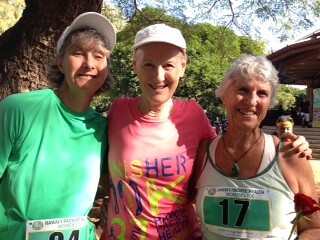 Three Honolulu Pi Phis entered the 39th annual Hawaii Pacific Health Women's 10k on March 6, 2016. 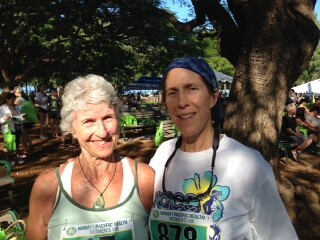 While Cassie and Brenda have entered several races over the years, Gerry is one of 9 women who have participated in the race for all 39 years. She says she never expected this to happen way back in 1978. If you think all it means is "I don't have a life on the first weekend in March, so enter the 10k" every year, not true - Gerry is making plans for the next 10 years of the race and she plans to outlast, outsmart, and be the Sole Survivor one day. The next race is already scheduled for Sunday, March 5, 2017 at 7 a.m. 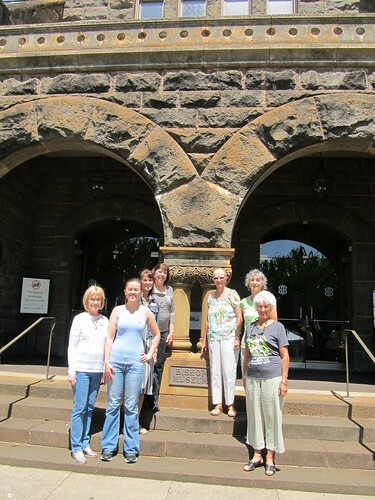 Yesterday, our members took a tour of the newly renovated Pacific Hall at the Bishop Museum. We were led by Sandy D., who explained the origins and migration of Pacific Islander cultures across all of Oceania. 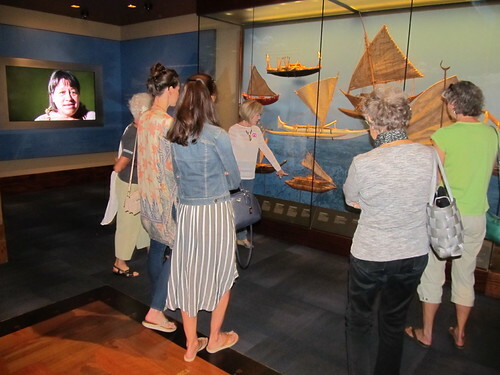 Afterwards, some of us enjoyed lunch at the cafe and happened to see the delivery of the treasured cloak and helmet of Kalaniopu'u to the museum! 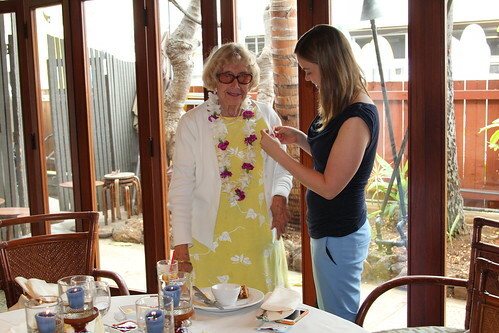 On Sunday, February 28, our alumnae club organized a literacy luncheon at Assagio's Bistro. Our guest speaker was Mr. Mike Braham from the Hawaii Literacy, who shared his experience as a tutor. He also read a letter written by one of his students. At the end of the luncheon, we presented Mr. Braham with a check to Hawaii Literacy, using money raised from our Make It, Bake It fundraiser last November. 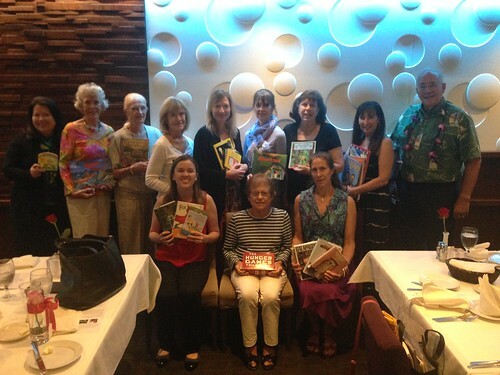 Members were also encouraged to bring books to donate to Hawaii Literacy's bookmobile. 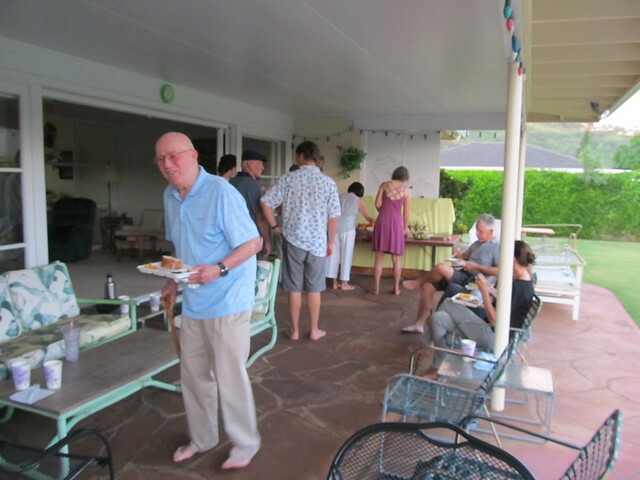 Mahalo to our new literacy chair, Pam, for organizing this great event! 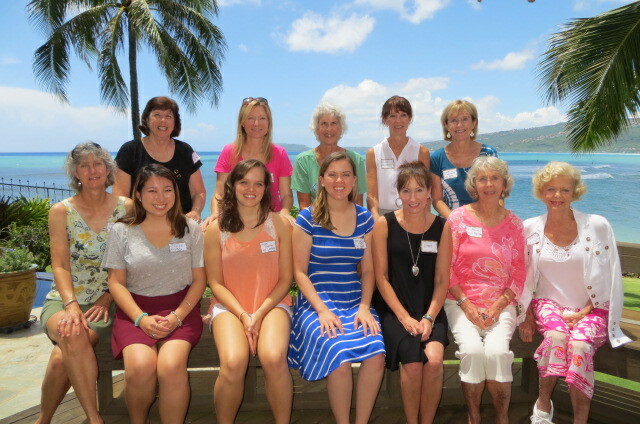 On Saturday, October 10, Pi Beta Phi members, friends, and invited guests gathered for a potluck dinner at Pam Ednie's home in Aina Haina. There were many delicious dishes: chili, sandwiches, chicken nuggets, fruit salad, bean salad, pasta salad, couscous, and apple pie. 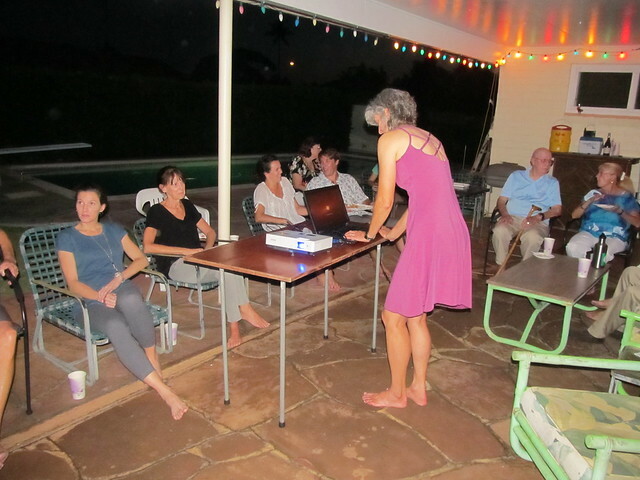 A true "Pi Phi in Paradise," Brenda Becker gave a visual presentation of her work in the Northwestern Hawaiian Islands studying the endangered Hawaiian monk seal - Hawaii's State Mammal. We learned what it's like to prepare and live on on a remote island and key findings of the monk seals gleaned from decades of research. With our alumnae club turning 90 years old in 2016, our theme this year is "Pi Phis in Paradise: Celebrating 90 Years of Friendship." The Cookie Shine is a tradition that brings memories back into focus. 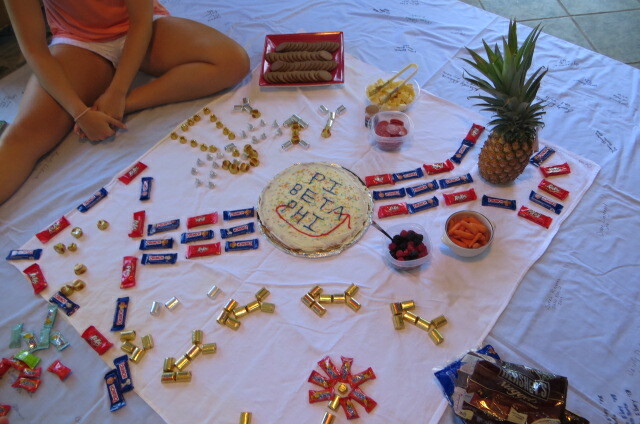 It shows the heritage and sisterhood shared by Pi Phis all over the world. The first Cookie Shines (130 years ago) resembled picnics with each member bringing a contribution. In a similar fashion, we asked each member to bring their favorite salad ingredient to contribute to our "Friendship Salad" and included picnic items in our cookie shine. Thank you to everyone who attended our Cookie Shine on September 5!